The ARCHITECT’S FORMULATOR is the perfect tool for any Architect. This program contains over 400 formulas helpful for architect. 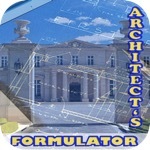 ARCHITECT’S FORMULATOR combines all of the formulas from our Electrical, Carpentry and Plumbing Formulators. In addition, this product also includes Concrete and Excavations formulas, that perform calculations for excavating or filling soil, the concrete required for a job and the bricks required for a wall. The program also includes special formulas just for architect for concrete and steel design, parking area and sidewalk design and even swimming pool design, as well as basic formulas for wind load and wind overturning force. The 23 formulas just for architect’s included now are just the start of what we expect will grow to over 100 formulas in coming months. The CARPENTRY section contains formulas that calculate the number of joists and studs required on a job. ARCHITECT’S FORMULATOR aids users to calculate the load on headers or the cost of hardwood flooring. There are even formulas to calculate the loads on walls and loads on beams. Formulas in the ELECTRICAL section calculate kilowatts, horsepower, efficiency, power factor, watts, amps, current, power, resistance, and voltage. This section includes formulas to calculate total resistance, capacitance, voltage drops, and transformer calculations. The formulas in the PLUMBING section calculate areas of pipe walls and the weights of different pipes. ARCHITECT’S FORMULATOR is able to calculate the final temperature when two bodies of water are mixed. There are also formulas in this section to calculate the expansion of pipes, radiant heat and heat loss cooling requirements, head loss and fresh air in room requirements All formulas can be saved or E-mailed. The program also remembers favorites and recent formulas. This app has a 3.0 star rating (21 ratings). It occupies the 200023th position in our ranking with 60 points. It is among the 5% best ones of its category and among the 10% best ones of the overall top.